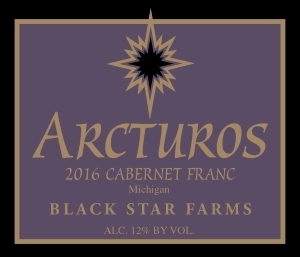 This Cabernet Franc is the result of premium fruit from two of our best vineyard sites. It is also a great example of how this varietal can excel in a cool climate region. Dark skinned fruit aromas dominate the nose and are followed by flavors of blackberries, plums and oak in the finish. With proper cellaring this wine will still be delicious in five plus years. Enjoy this hearty red with meat or veggie lasagna, Beef Bourguignon, lamb kabobs and strong cheeses. This has been one our most prominent red varieties for almost 15 years now, and the grape never ceases to delight me. When we first started bottling it, back in 1998, the variety had very little following, and most people had never heard of it. Now the variety has become a bit of a fad and you are seeing the proud proclamation of it on wine labels from Bourgueil to California to Zurich. The truth of the matter is that this variety shines best with an extended growing season and in a cooler climate, basically what Michigan is all about! This latest bottling will not disappoint the fans of this variety, and will only get more complex and interesting in the next 3 to 5 years.